To give your vehicle a long life, you have to keep up with auto maintenance. Regular checkups and auto repairs are the key to ensuring that your vehicle will last for a long time. Since not every car owner is a mechanic, it might be difficult to figure out what you need to have done to your car on a regular basis. Fortunately, a checklist can make it easier. Before the checklist, however, here is why it’s important that you keep up with maintenance. If your car has worn tires or engine issues, you might not notice until it’s too late. When it’s too late, these problems may cause accidents. It’s important to have regular check-ins to take any problems into account and to fix them right away. Regular maintenance costs less money. If you keep your vehicle maintained, you are less likely to spend more money on expensive auto repairs later. Your car is less likely to break down. With regular maintenance, you can take care of dings and scratches on the vehicle. This keeps your car looking good for years to come. Cars can emit harmful fumes. These can be worse when your car is unmaintained. If you maintain your vehicle regularly, it is less likely to harm the environment. As far as your checklist goes, you can always go beyond. 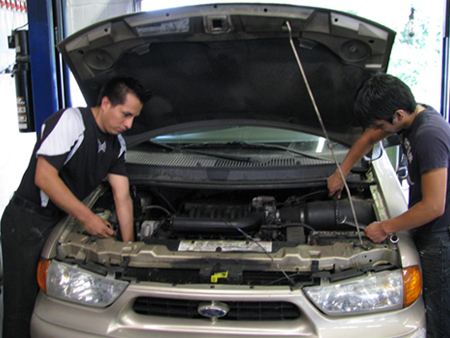 The more that you maintain, the less likely you are going to have to deal with expensive auto repairs down the road.